Holy macaroni, the vegan cookoff blog has been updated again (thanks Jen, our holy archivist). If you haven’t heard of them, our monthly vegan cookoffs are pretty much the best thing ever. We set a theme and then show up at one member’s house with our entries on the pre-decided date. Everyone presents their dish to the attendees, one dish at a time, and afterward everyone votes on their favourite dish in each of five categories. There’s more to it than that, but that’s the general idea. This month’s theme was “the bean”. We had eleven entries of delicious, creative, vegan bean dishes. 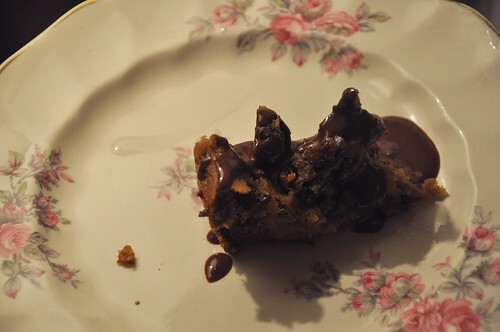 My entry was a modified version of Chocolate Covered Katie’s Chocolate Chip Blondies made with chickpeas in place of flour. I served them with candied black beans and a black bean chocolate sauce. What a success! I surprised everyone enough that I ended up winning. This entry was posted in Events, Photos on June 21, 2011 by malloreigh. is there a recipe available for the “the bean” – keepin’ it cas-o-real ? and if so, can i has? it looks delicious, and i wanna eat it .. .so yeah. Hey Leanne, if you can find Luc Janz on Facebook I’m sure he’ll be more than happy to share that recipe with you! 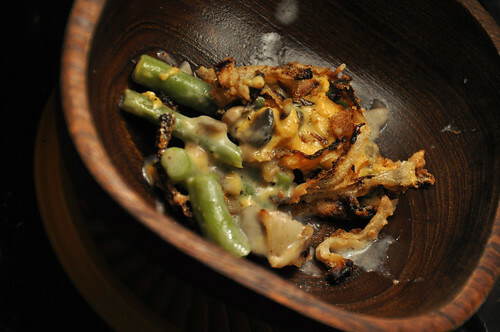 If not, there’s probably a similar (though maybe not quite as Luctastic) green bean casserole recipe online through VegWeb or something like that.